Both departments have their own board. The departments, in turn, are divided into sections. The highest organ in the Academy is the general meeting of members, the united meeting of both departments. The president was Frits van Oostrom until 1 May 2008, after which he was succeeded by Robbert Dijkgraaf. Both van Oostrom in his leaving address and Dijkgraaf in his inaugural address have voiced their worries about the low level of funding in science in the Netherlands compared to almost all other western countries. In March 2012, Hans Clevers was elected president and took office in June 2012. In 2015 he was succeeded by José van Dijck. 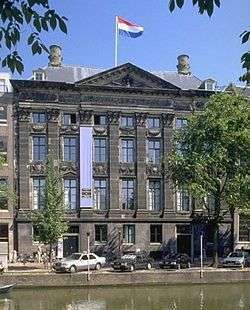 ↑ President: José van Dijck, Royal Netherlands Academy of Arts and Sciences. Retrieved on 2015-06-18. ↑ "Hans Clevers volgt Robbert Dijkgraaf op als president KNAW". NRC Handelsblad. 2012-03-26. Retrieved 2012-03-28. ↑ "The Academy Institutes". Retrieved 11 July 2016. ↑ Loerts, Hanneke (June 2009), "De Jonge Akademie, a new and a leaving member meet" (PDF), Newsletter of the Graduate School for Behavioral and Cognitive Neurosciences: 1–3 . ↑ Brück, Tilman; Beaudry, Catherine; Hilgenkamp, Hans; Karoonuthaisiri, Nitsara; Salah el Din Mohamed, Hiba; Weiss, Gregory A. (April 2010), "Empowering Young Scientists", Science, 328 (5974): 17, doi:10.1126/science.1185745 .